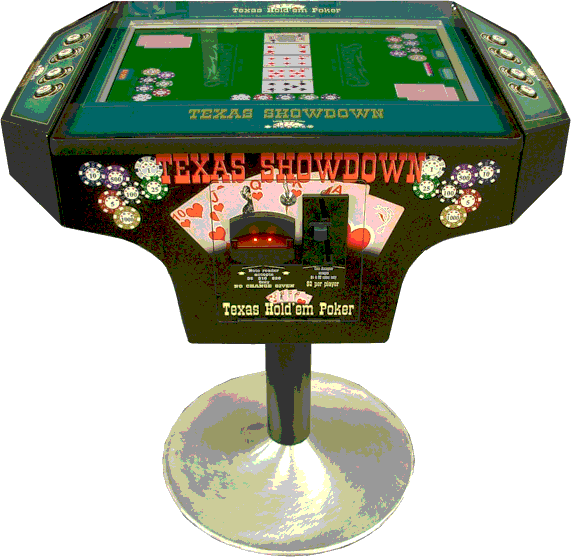 Introducing Texas Showdown, our latest single player or dual player (Player Vs Player) Texas Hold'em Poker video cabinet. Great attraction for all Bars, Pubs, Night Clubs etc. keep your customers happy and give them what they want. Texas Hold'em poker all the rage on TV, many bars are having their Poker nights and your missing out on a big opportunity. By installing a Texas Showdown cabinet in their premises you are helping the location out as they don't need to run and organise competitions...it’s a win-win situation. 24" High resolution LCD screen. Lockable Cash box (Notes & Coin). Only 4 push buttons per side. Operator settable Price per Play. Operator settable number of Hands to be played. 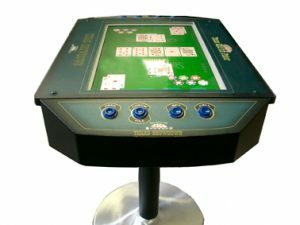 Texas Hold'em is one of the most dramatic and popular varieties of poker in the world, and it seems like everywhere you turn there is another show, another website, or another article dedicated to the subject. But, how do you play the game? How does it differ from classic poker games, such as Five Card Draw? And what exactly is a Flop, anyway? This article will walk you through a Texas Hold'em game from start to finish, you will learn Texas Hold'em poker rules, and by the end you will be ready to "Shuffle Up and Deal!" A full Texas Hold'em table typically has nine or ten players; any less and the game may be referred to as short handed. To determine who begins the game a single card is dealt to each player; high card will be the first dealer. The dealer position is indicated by a white plastic chip referred to as the button, which is also what the dealer position is called, sometimes referred to as being on the button. After each round of play, sometimes called a hand, the dealer button rotates to the left, ensuring that everyone gets to play in this and all other positions. Before cards are dealt the forced bets must be paid, which are called the big blind and the little blind. The little blind is sometimes called the small blind as well. A bet is when money is put into the pot for the first time in a round. The amounts of the bets and blinds are predetermined, and the little blind is always half the big blind. The little blind position is always the seat to the left of the dealer, and the big blind is the seat to the left of the little blind. The dealer will then deal two cards (referred to as pocket cards or hole cards) face down to each player, one at a time, starting with the player on his left. Once the cards are dealt, each player looks at their cards; on their action they must then decide if they wish to call the current bet (the big blind, which is the highest amount bet at this point) which means to match it, fold their hand with out betting if they don't like their cards, or raise the bet by putting in more money. Each player, starting with the seat to the left of the big blind, makes their choice and acts. If a player raises the bet, each player must now call the new amount, including those who may have already acted. At any time a player may re-raise, meaning that they raise it again beyond the amount it was raised previously. If no player raises the big blind, then the player in that position may check, meaning they do not want to put more money in, or raise. It is important to note that if a players raises he may not raise again unless he was re-raised, as opposed to called. The round of betting stops when all players have either folded or called the last raise. The dealer burns a card, which means they deal it to one side and it is not used in play, and then deals three cards face down. The dealer then turns the thee cards face up simultaneously; this is called the Flop. These are the first of five community cards that all players can use, along with their pocket cards, to make the best possible poker hand. The standard poker hand ranks are used. The player in the little blind position (once again, the first seat to the left of the dealer) is now UTG, or Under The Gun, meaning they are first to act now and on every subsequent round of betting. They must make a decision as in pre-flop play, with one change: they can choose to check if they don't want to bet or fold. Many experts advise players to stop here if they do not improve their hand, as they have now seen five of the seven cards they will use. Once again, the betting round ends only when all players have folded or called the last bet or raise. The dealer burns another card and then deals a fourth community card, called the Turn, face up. There is another round of betting, exactly as after the flop, with the small blind seat being UTG. After a final burn card, the dealer turns over the fifth and last community card, called the River. There is one final round of betting. At this point (or before) if all but one player folds, the last player who didn't fold wins the pot. This player may muck his hand, which means to toss it into the discard pile by the dealer without showing anyone what it was. A showdown occurs when a player is called after the River, and could involve anywhere from two players to the entire table, depending on how many stayed in to this point. All players still in the hand show their cards, starting with the last person to bet. At any point after this player showed his cards other players in the showdown may muck their hand, essentially conceding the pot; just think of mucking as folding. They are admitting they have been beat without having to show their cards. This strategy (mucking) helps keep the other players from learning your playing style, such as if you bet heavy on two pairs or like to chase a flush. That is the essence of Texas Hold'em, but there are a number of other important points to understand. Where you sit at a Texas Hold'em table is a very important factor in how you play. The dealer position is considered the strongest on any given round, as being on the button means you act last in every post-flop round. Acting last means you act with the most information, which is essential to making the right decision whether to bet or raise, check, call or fold, and the game of poker is all about making the right decisions. Being in early position means you are one of the first to act in a round of betting, and is considered weak due to the lack of information you have before you act. Middle position is less weak and falls between the early and the late position. The late position is the strongest, such as the dealer and the player to his right, who is referred to by some as the cutoff. The cutoff could take the choice away from the dealer by betting or raising big, bumping him out and becoming the latest player in the hand, and thus in the strongest position. Besides everyone but you folding, the only way to win a hand is in a showdown. The five best cards are used out of the five community cards and each player's hole cards, which can lead to some interesting situations. For example, if the board, or table cards, is AAKK9 and no player has better than a pair of eights in their hand, the board is the best possible hand, and all players in the showdown will chop the pot, which means to divide it evenly among those players. The same holds true if two players tie a hand. In the event of a flush or a straight, the player holding the highest card in the series wins; if the board has the five highest, the pot is chopped. One last note; Texas Hold'em can be played as Limit, No Limit, and Pot Limit. Limit Hold'em means that you can only bet up to a predetermined amount, typically equal to the big blind, and raise the same amount. Raises are typically limited to four or five "bets" total, meaning the big blind, the first raise, and then three or four more raises. Pot Limit Hold'em means you can raise up to the current amount in the pot, but no more. No Limit Texas Hold'em is the most dramatic of the three, where any player, at any time, can declare All In and bet everything he has. A player calling an All In move with too few chips creates a side pot, which he cannot win and is separate from the main pot, which he can.